Five years. My, how the time has flown by. 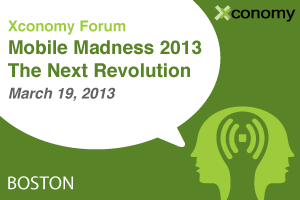 I’m very pleased to announce Xconomy’s fifth annual spring mobile conference in Boston. “Mobile Madness 2013: The Next Revolution” will take place on the afternoon of March 19, at Microsoft NERD in Kendall Square, Cambridge. Here’s the overall theme. What most of us think of as the mobile revolution is over. Since the debut of the iPhone in 2007, our daily lives have been transformed. We’ve seen an explosion of mobile apps and websites— and, increasingly, new phones, tablets, and other smart devices—with which to browse content, communicate with friends and contacts, get recommendations, make purchases, share photos, and so on. Mobility has become part of the fabric of daily life, and we already take it for granted (let alone our kids). So what will the next revolution look like? What lies beyond our current conceptions of mobility? For starters, how will the mobile platform wars shake out for consumers, entrepreneurs, investors, and enterprises? And how should we think about how mobility has seeped into almost every aspect of business, and almost every vertical industry? On March 19, we will convene tech and business leaders from the Boston area and beyond for a half day of interactive talks, chats, and networking to address these questions. A few items on the preliminary agenda: mobile health strategy; consumer and enterprise app strategy; mobile commerce and payments; mobile advertising; and the startup investment climate. —Jonathan Bush, the co-founder and CEO of Athenahealth, which is acquiring West Coast mobile-app firm Epocrates as it makes a big push in mobile health. —George Bell, the CEO of Jumptap, one of the stalwarts of the resurgent Boston mobile-advertising scene. —Wayne Chang, the co-founder of Crashlytics (and post-PC-era spokesman), a hot startup that targets mobile bugs for now, but is really targeting the future of software development. You might notice that we have a mix of mobile insiders and outsiders. That’s intentional. Mobile tech has become so pervasive—and integrated into so many places—that we can’t afford to hear from just “mobile industry” experts anymore. That term becomes less relevant and more dated every year. I’m still working on the agenda, so if you’re a mobile leader and haven’t heard from me yet about speaking, hold your horses, but feel free to shoot me a note. (Friendly warning: we get a ridiculous number of requests to speak at this event.) Plus I’m trying to get some new people into the program. Meantime, you can check out the speaker list and agenda as we update it here. We look forward to seeing you at NERD on March 19.